So with the patch, other than Ulduar, I haven't really found that much that interests me other than the Argent Tournament. To start, there's a couple quick quests to do and then you can pick up three quests which reward Aspirant's Seals. 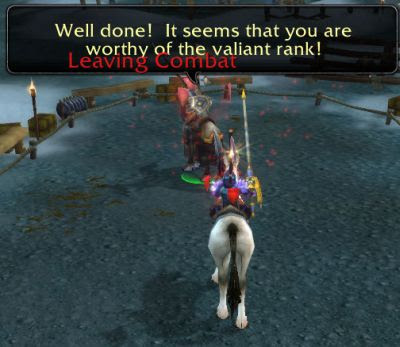 Once you have 15 of them, you earn the Argent Valor achievement and can now become a Valiant for your faction. So after getting my 15 seals (5 per day for 3 days), I now can start working on collecting Valiant's Seals, needing 25 to then challenge the Argent Champion. Once I best the champion, I believe I will be an Exalted Champion of Gnomeregan, thus becoming Tiddlywinks of Gnomeregan. I'm believe I can get 5 Valiant's Seals per day, so it might only be five days (yay Monday) until I become a Champion of Gnomeregan, however, it is yet to be seen whether all nine seals are available each day. Once I become an Exalted Champion, I believe I'll be able to pick which faction I want to champion next. At 5 days per faction, it should be relatively easy to earn the titles with each faction. Also, upon becoming an Exalted Champion of Gnomeregan, I can challenge the Black Knight and earn It's Just a Flesh Wound. Basically though, I'll be an Exalted Argent Champion of the Alliance in 25 days. Five for Gnomeregan, and then 5 more days for Exodar, Stormwind, Darnassus, and Ironforge. So in just 25 days I'll be done with the Argent Tournament. Of course, after the 25 days, I'll have to do the dailies every day to earn Champion's Seals in order to purchase my 5 faction specific pets (200 + another 200 seals to earn those pets to trade to the horde in exchange for their pets), then 250 more for the Argent Hippogryph and 500 more for the faction specific mounts from each faction - the Great Azuremyst Elekk, Swift Ironforge Ram, Turbostrider, Swift Darnassian Mistsaber, and Swift Elwynn Steed. So that's only 1150 Champion's Seals...minus 50 from becoming a champion of each faction (10x5), and I only have to earn 1100. At 5 per day...well...that's 220 days of dailies - but there should be more dailies opened up once the coliseum is built, but who knows. Obviously the pets come first, so that's just 70 days of dailies, still a few too many for me. So, have fun at the Argent Tournament - a nice long grind once you complete championing your factions. Yay!